The Robotron 1715 was designed in Eastern Germany and manufactured by VEB Robotron B�romaschinenwerk "Ernst Th�lmann" in S�mmerda. It was based on a Z80 CPU (in fact Eastern clone U880), and used SCP, a CP/M compatible operating system. It was widely used in Russia and other East European countries for office and educational purposes. Although it didn't stand the comparison with Western PC systems, it was a very robust and reliable system daily used by numerous companies in every field. One of its main drawback is that it didn't have any graphic resolution. There were different models of the 1715, with different memory and floppy configurations. The 1715M had 256 KB RAM and SCP3 (CP/M 3.0 clone) as its OS. 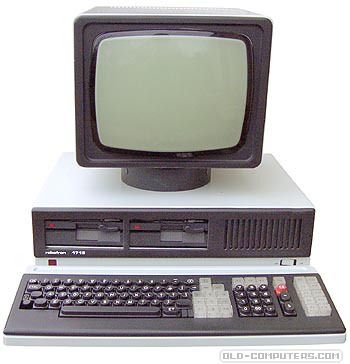 The 1715 was the direct successor of the Robotron A5120 and was fully software-compatible with it. see more Robotron PC 1715 Ebay auctions !